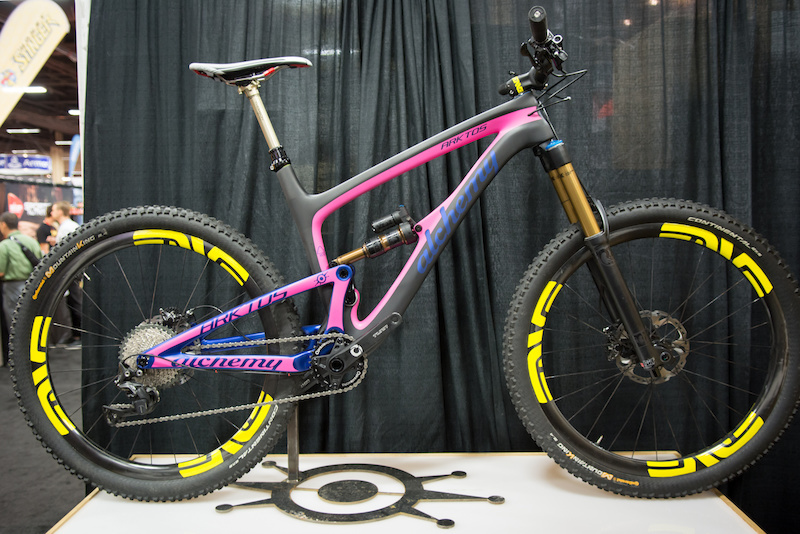 Alchemy Alchemy (MSRP $7999) — Alchemy brings its expertise in high-end carbon to the Arktos: Alchemy’s full-suspension mountain bike in the form of tube shaping and layups that target stiffness and strength where needed, as well as durability that stands up to the rigors of aggressive trail riding. It has 6 inches of travel, 27.5-inch wheels and pretty typical trail bike geometry. The Arktos features a new dual-linkage platform called Sine Suspension that Alchemy licensed exclusively from David Earle. The name Sine derives from the way the shock rate, when graphed, resembles a sine wave: It’s regressive through the first part of the travel to absorb small bumps and provide climbing traction; progressive in the middle of the stroke to avoid wallowing on big hits or in hard, fast corners; then slightly regressive again in the last 15 percent of the stroke to enable the bike to use all 6 inches of its rear-wheel travel. Sine is also designed to minimize chainstay growth when the bike is moving, which is intended to help with pedaling efficiency and keep the suspension active under braking.